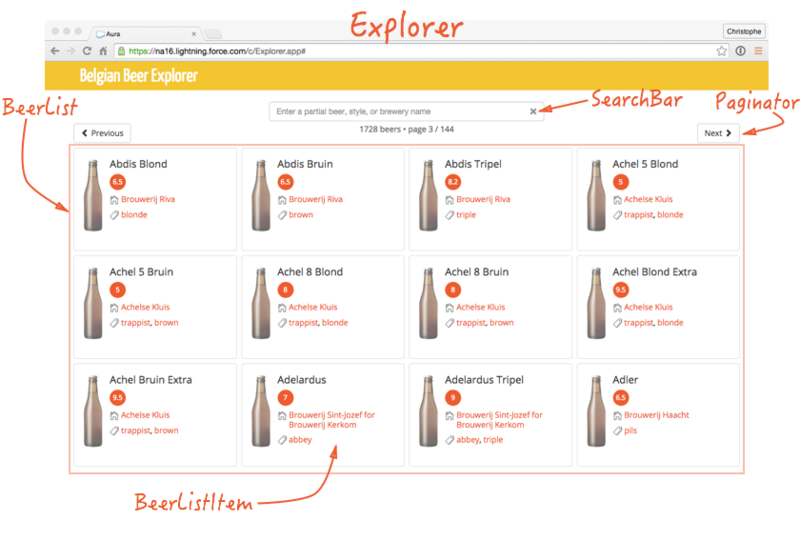 Learn how to build interactive apps like this Belgian Beer Explorer using Lightning Components. Belgium has a long tradition of beer making. According to Wikipedia, the country counts over 1700 beers of various styles, including Trappist, Abbey, Saisons, Lambic, Gueuze, Fruit Beers, White, Double, Triple, Quadruple, etc. As I was experimenting with the new Lightning Components, I thought it would be fun to build an app that lets users search and explore this list in different ways: by name, style, brewery, alcohol content, etc. I learned a ton: not only building the application, but also using it! In this post, I’ll show how the application works and how to install it in your own org. The data is imported in two custom objects: breweries and beers. The client side of the explorer is built as a Lightning Application that assembles different Lightning Components: SearchBar, Paginator, BeerList, and BeerListItem. These components communicate using Lightning events. The data is provided by an “Aura enabled” Apex controller. Sign up for a new free developer environment here. Enable Lightning Components in your new Developer Org: In Setup, click Develop | Lightning Components, check the Enable Lightning Components checkbox, and click Save. Click this link to install the application using an unmanaged package, then click Continue, Next, Next, Install. You currently have to disable Lightning Components for the Data Import Wizard to work correctly when importing csv files. To disable Lightning Components: In Setup, click Develop | Lightning Components, uncheck the Enable Lightning Components checkbox, and click Save. For Which Brewery field in your file specifies the Master/Detail relationship?, select Extenal ID. The source code for the application is available in this GitHub repository. If you’d like to get started building your own Lightning Apps and Components, take a look at the new Lightning Components module in Trailhead. You’ll earn a new badge, and be able to show off your Lightning skills.